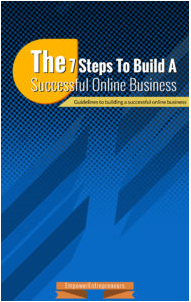 This simple and easy-to-read guide will show you...The reasons why most online businesses fail. The true business-building secrets that smart online marketers and online entrepreneurs are using are revealed. This book is available instantly for download after entering your Email. The book reveals how startups can test their business ideas before investing their money and time. You will learn how you can perform an effective market research. You need to know if there is a need in your chosen niche. There are so many businesses online and it gets frustrated if you can’t make a dime after investing so much. You need to set up your business right in order to make profit from it. This book reveals the power of effective marketing online. Social media, email marketing, video marketing, webinar, podcast, affiliate marketing. We touch base on how to effectively use these marketing methods to scale up your business. I highly recommend this book for any anyone that is trying to take his/her business to another level. This book helps me to start my business on a solid foundation and i was able to scale up from there. Good job EmpowerEntrepreneurs!